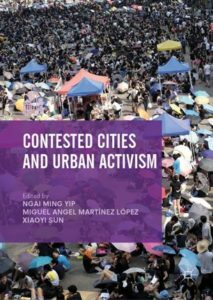 This edited volume advances our understanding of urban activism beyond the social movement theorization dominated by thesis of political opportunity structure and resource mobilization, as well as by research based on experience from the global north. Covering a diversity of urban actions from a broad range of countries in both hemispheres as well as the global north and global south, this unique collection notably focuses on non-institutionalised or localised urban actions that have the potential to bring about radical structural transformation of the urban system and also addresses actions in authoritarian regimes that are too sensitive to call themselves “movement”. It addresses localized issues cut off from international movements such as collective consumption issues, like clean water, basic shelter, actions against displacement or proper venues for street vendors, and argues that the integration of the actions in cities in the global south with the specificity of their local social and political environment is as pivotal as their connection with global movement networks or international NGOs. A key read for researchers and policy makers cutting across the fields of urban sociology, political science, public policy, geography, regional studies and housing studies, this text provides an interdisciplinary and international perspective on 21st century urban activism in the global north and south. Ngai Ming Yip is Professor at the Department of Public Policy, City University of Hong Kong. His research focuses on housing activism as well as movement networks of homeowner activists in China and has published an edited volume entitled Neighbourhood Governance in Urban China(2014). Miguel Angel Martínez López is Professor of Housing and Urban Sociology at the IBF (Institute for Housing and Urban Research), Uppsala University, Sweden. A sociologist and political scientist, his academic work deals with urban movements, anti-neoliberal struggles, autonomous social movements, citizen participation, urban sociology and urban politics. Xiaoyi Sun is an Assistant Professor at School of International Relations and Public Affairs, Fudan University, China. Her research focuses on environmental politics, contentious politics, and urban governance in China.